If you mean the identifier in the new Windows 7/10, which is now called "Computer" instead of "My Computer," then there is no difference between "My Computer" and "Computer"
In the My Computer or Computer folder, you can see the drives from your computer. I think that's why MS decided to call it a "computer". However, by right-clicking, you can rename it at any time in "My Computer" or "WS" or at your discretion. 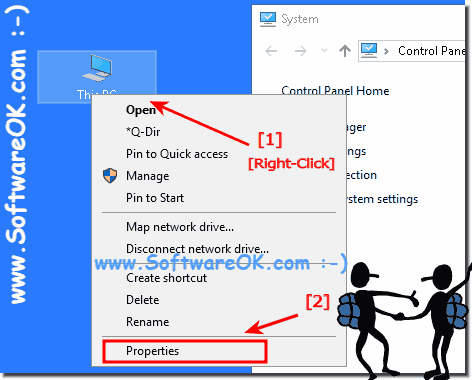 By right-clicking on the icon, you can also start the properties of the windows computer! (Image-1) Workplace, This PC and computer on Windows MS OS! The difference between server and workstation PC does not exist, it is only a role that takes over the respective computer. The server works largely unattended, usually in a well-cooled room, where it performs its tasks. In the case of non-functionality, an administrator usually comes and corrects the error, or the server is replaced by a new one. A computer is not a shortcut as Com and Puter. Earlier computers were designed only as computing devices. z. B. abacus and slide rule. Today they are working on an even simpler principle, being or not, so simply put 1 (ONE) and 0 (zero). The human computer is someone who can play very well with numbers. Today's computers are electronic devices that execute data, processes. Create predictions and statistics. Use memory to archive the results. Well suited as data processing equipment because they do not ask questions. And usually do their job silently.